Peel the slices of prosciutto and lay into a hot pan with a little bit of olive oil. Cook until crispy and remove to a paper towel lined plate. In a non-stick sauté pan, add 1tsp California Butter. Crack one egg into the center of the pan and cook gently until the white is firm but the yolk is still soft. Gently slide the egg off and repeat with the other eggs. Take each slice of bread and layer with tomato and cheese. Place under a broiler until cheese is melted, remove and reserve. 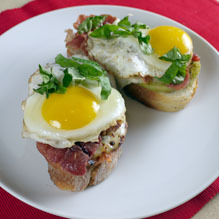 Gently slide the eggs on top of the sandwiches.